Watermelon rind pickle is not familiar to many people, but I have fond memories of this weird and wonderful food. I wasn’t more than six or seven when the Cross and Blackwell jar with rectangles of the pickle suspended in a briny syrup called to me. My mother found me in the kitchen, an empty jar and a smile on my face. The pickle was assertive and crisp-tender, heavily spiced with cinnamon and clove. They were the most exotic food I had ever tasted. Time passed and a few years back, before I knew Stella Parks and called her my friend, I read about candied watermelon rind on her blog, The Brave Tart. Ever since, I have been making little batches of these pickles trying to figure out a way to take some of Stella’s technique and incorporate it into the safe structure of canning I found here and here. I made batches that were close to what I wanted, but weren’t quite right. They were rubbery, not tender and crisp. The flavors were dull. The spicing was too heavy. Hallelujah! I think I finally got it right with this batch. And they’re so cute! Make a batch just for the heck of it. The prep is a pain but the pickle is transcendent. I use a large table spoon to scrape the rind and remove all traces of the fruit. Cut the rind into strips about 2-inches wide and use a vegetable peeler to remove the green outer rind. You should be left with white rind about 1/4-inch thick. 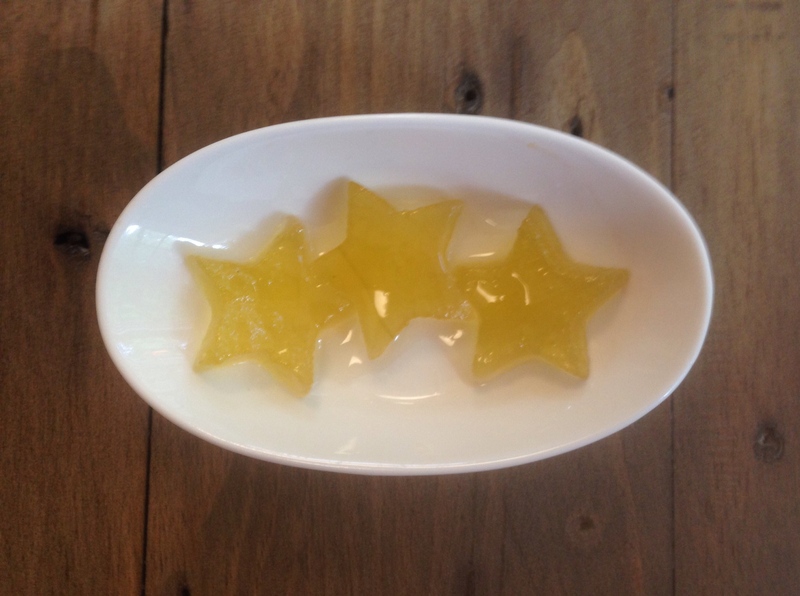 Cut the rind into 2-inch by one-inch squares or have fun and stamp out stars or fluted circles. After all the prep expect to have about 4 cups of rind. In a 5 quart or larger pot, bring 3 quarts non-chlorinated water and the salt to a boil. Stir to dissolve the salt. Remove the pot from the heat. Add 8 cups of ice cubes to cool off the brine. Add the rind and let it sit in the brine for 3 hours or as long as overnight. Rinse the rind well. If using alum, in a large non-reactive bowl add the alum and 4 quarts of non-chlorinated cool water. Stir until dissolved. Add the rind and soak for two hours. Be gentle with the pickles from this time forward, they will be delicate. Tie up the cinnamon, cloves, star anise and peppercorns in a cheesecloth bag. In a heavy non-reactive 3 quart or larger pot, add the sugar, vinegars, water and spice bag and bring to a boil. Reduce the heat and hold at a low simmer until the rind is blanched. Rinse the rind well. Bring 3 quarts non-chlorinated water to a boil. Add the rind and blanch, simmering for 5 to 10 minutes until it is tender. 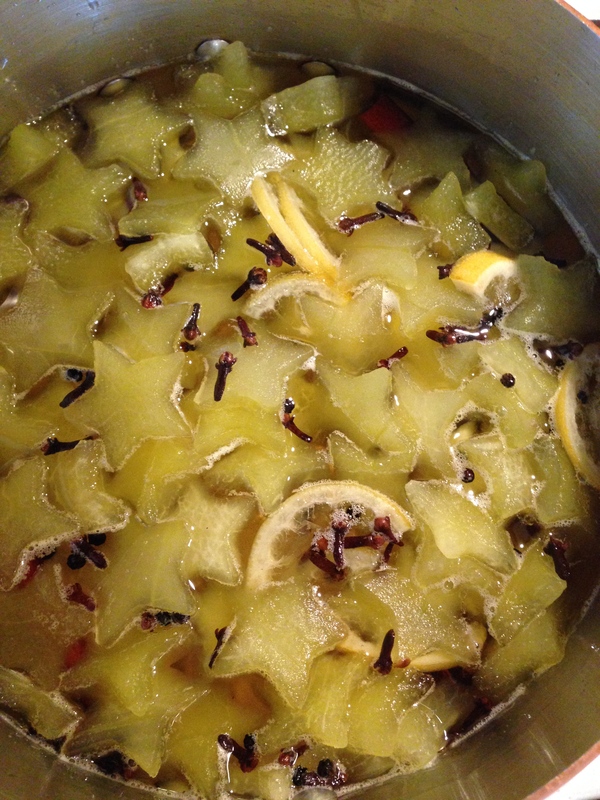 Using a spider or strainer, remove the rind and place it in the simmering syrup. Simmer the rind for about 30 to 45 minutes, until the pieces are translucent and suspended throughout the syrup. Remove from the heat and leave the rinds in the syrup, uncovered, overnight. Bring the brine and rinds back to a boil. Pack the rinds into the jars then pour the syrup over the rinds to a 1/2-inch headspace. Clean the jar rims, place the lids and rings and process ten minutes. Let the pickles mellow for at least a week. Serve ice cold. I soak my rind in pickling lime over night. I’ve never used star anise, but I do use ginger & cardamom. I like the stars – very festive! Why, Becky? What does this do? Thanks.. The pickling lime has the same effect as the alum I use, it keeps the pickle very crisp. I happened to have alum and not pickling lime on hand! Ginger is a SUPER WONDERFUL EXCELLENT idea! I haven’t used pickling lime. Do you like it for crisping cucumber pickle, too? I’m excited to try your recipe if they turned out. I love pickled watermelon rind, but the time I tried to make them myself was an absolutely grotesque failure. So disappointing. These have the same texture as the Cross & Blackwell, crisp but tender. I am finally happy with the result! I hope you try it. wow, these are very pretty . 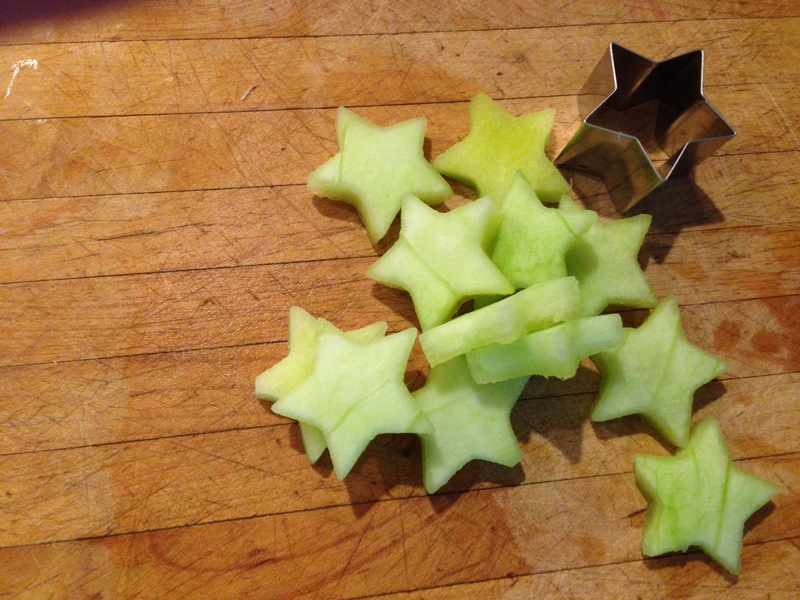 I love the idea to use a star-shaped cutter! The only time I have made watermelon rind pickles was using a recipe from Momofuku with star anise and ginger, which was quite nice but can be eaten within a day and probably doesn’t keep as long as your recipe. When are the lemon slices added–with rind at beginning or with spices when making the syrup?